A little bit of paper piecing this time around using another free stamp from Get Stamping magazine. 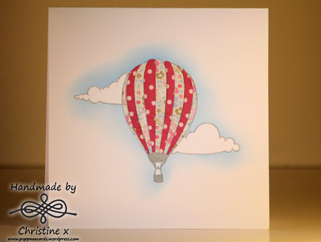 I first stamped the balloon image and clouds onto the card base, then masked them off. I used Tumbled Glass Distress Ink to add the background, taking care to keep the edges really soft so that it looks like it has been air-brushed on. It was then really simple to stamp the balloon image onto two different patterned papers, cut them out and stick them onto the card.